I have officially completed my first week in the spa nail program! It was such an exciting week that I’m not sure where to start. Well let me just say the whole age thing I was worried about is not an issue. I am not too old to get in the nail game. If anything, at my age and life experiences, it’s a plus! So my first day was like Christmas morning — I wish I could insert music/video where you hear harps and see sparkles)! I got this huge CND duffle bag filled with nail awesomeness. 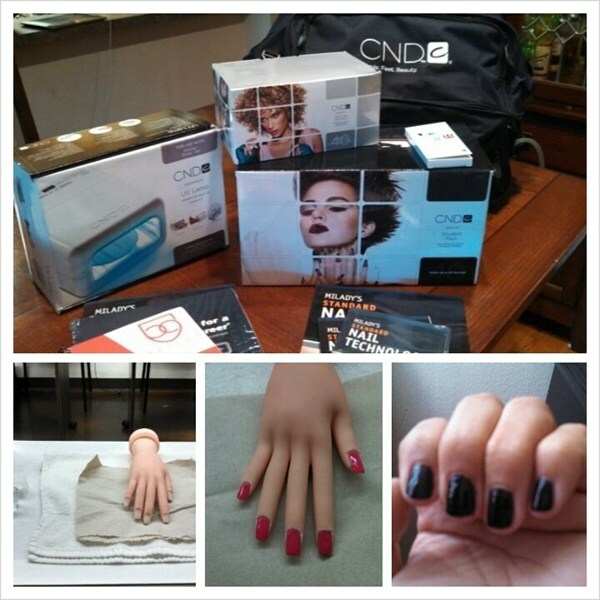 Everything from CND, including the company’s new Vinylux polish, which apparently is a hot commodity there! The class was working on state board procedures, which was nice to start with proper set up and sanitation. I learned how to properly do a manicure, add on a tip, put a form on as well as sculpt the nails. I got the hang of it pretty well except for the sculpting part — would you like a lumpy set with your polish?! There is so much to learn; I can't wait! This coming week, we will be going over gels. I’m super excited! For the first time in, I don't know,maybe ever, I finally feel like this is exactly where I am supposed to be. The road I was meant to take. Yes, it already feels like that!